2019 Audi Q5 Trim Levels with Comparisons & Configurations. What 2019 Audi Q5 Trim Level Should you Buy? What is the Difference Between Trims? Since its launch into the market back in 2009, the Audi Q5 has been making some serious headlines. Right out of the gate, it was a best-selling vehicle for Audi, and it has remained a popular seller ever since. Of course, the market itself has changed since then, becoming more saturated with crossover SUVs. For a while, the Q5 remained unchanged in an expanding segment. Last model year's release, however, shook things up a bit with the introduction of the Q5's second generation. The 2018 line-up brought with it more power and options than ever before. Those changes? They carry over to the new 2019 Audi Q5 and its three distinctive trim levels: the Premium, Premium Plus, and Prestige. Regardless of which trim level you buy, it will come equipped with a standard 2.0-L turbocharged 4-cylinder engine. This engine is capable of producing 252 hp and 273 lb-ft of torque, which is a good showing of power for a vehicle in this class. The powertrain is rounded out with a 7-speed dual-clutch automatic transmission. The drivetrain is all-wheel drive, which comes standard on each trim. Despite running on the same strong engine, the Premium, Premium Plus, and Prestige have quite a few differences that separate them one from the other. Trying to select the right one for your unique needs might take some time even though you only have three trim levels to choose from. Since these are certainly not simple economy vehicles, you will want to know what you're investing in before you make that commitment. That being said, let us break down each trim level and compare them. After reading this review, you should have a clearer idea of which 2019 Audi Q5 trim is the best choice for you. 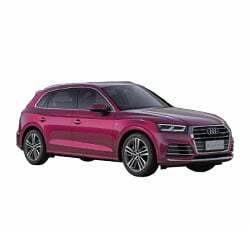 Compare the 2019 Audi Q5 Premium vs Premium Plus Trim Levels. What is the difference? First up on the Audi Q5 trim level ladder is the base Premium trim. Like the two higher trim levels that are equipped with the same 2.0-L turbo engine and all-wheel drive, the Premium gets a combined 24 mpg (22 mpg in the city and 27 mpg on the highway). And, with the standard 8.2 inches of ground clearance, even the Premium can handle some light off-roading adventures. The Premium sits on top of 18-inch five-double-spoke-dynamic design wheels that come decked out with all-season tires. This trim comes with an electric rear spoiler, LED daytime running lights, Xenon Plus headlights, and LED taillights that are equipped with dynamic turn signals. Also on the exterior is a spot where you can add a towing bracket on. The interior of the Premium is decked out in dark brown walnut wood inlays that provide a nice contrast against the upholstery. The seats are given some stunning leather upholstery, thus creating the impression that you are riding around in the lap of luxury. Overall, the design is chic, and you will not get the impression that anything inside of the Q5's cabin was cheaply made. Of course, having the right safety features and equipment is just as important (if not more so) than how the vehicle looks. The 2019 AUdi Q5 Premium trim level comes with the Audi pre sense basic, which is a technology package that includes a suite of predictive safety features. There are three different expanded elements of this system: Audi pre sense front, Audi pre sense rear, and Audi pre sense plus. All of these systems work with Audi's adaptive cruise control and side assist features to create a safer drive for every owner. The Q5 also has the Audi pre sense city, which utilizes sensors on the vehicle to detect and monitor the presence of vehicles and pedestrians when the vehicle is going at speeds below 52 miles per hour. If the vehicle detects an impending collision at a speed of about 25 miles per hour or less, it will employ the emergency braking feature to bring the Q5 to a complete stop. Additionally, Audi's Connect system comes with the Premium trim level. This includes features such as Google Earth, myAudi navigation, the myAudi app (which provides features like keyless entry and a car finder), information about parking, a WiFi hot spot, and Amazon music. The Connect CARE feature adds a number of security and assistance programs, such as SOS calling and Audi Service Request. This makes it easier for drivers to get help when they unexpectedly need it. Of course, the Premium Plus trim level has much of what you will find on the base Premium trim. However, it features some pretty decent upgrades that help to justify the elevated price tag. It should be noted that the Premium Plus does have a starting MSRP of roughly $7,000 above that of the base Premium trim level. That is going to be the most obvious difference that potential customers will notice. The Premium Plus gets more standard Audi pre sense features, including Audi pre sense side assist and Audi pre sense rear with rear cross traffic and vehicle exit assists. These features help the driver safely exit their vehicle and keep them in the know about what is going on behind the vehicle. Also, the Premium Plus trim level comes with the Audi virtual cockpit. MMI Navigation Plus is also equipped on the vehicle, which gives the Q5 MMI all-in-touch and Prime and Plus for the Audi connect system. The MMI Navigation Plus contains live traffic feed, Google Maps, and voice control functions. You will also notice some nice interior design upgrades on the Premium Plus. Inside of this trim level, Audi gives you a standard panoramic sunroof, dark brown walnut wood inlays, and aluminum door sill inlays that nicely contrast with the walnut wood and the color of the upholstery. The panoramic sunroof is the real upgrade here as it evokes a stronger sense of luxury than the Premium trim. Finally, the exterior of the Premium Plus has a few noticeable changes as well. The 19-inch wheels have a five-arm-wing design that sets them apart from the standard five-spoke set-up on the Premium's 18-inch wheels. Upgraded all-season tires are included on the Premium Plus. Also, the Premium Plus gets the full LED light treatment. Aside from that, you will still find the towing bracket provision, electric rear spoiler, and heated, power-folding side mirrors with memory capabilities on the Premium Plus. Compare the 2019 Q5 Premium Plus vs Prestige Trims. What is the difference? If the Premium Plus is not luxurious enough for you, there is the line-topping Prestige trim level. This upgrade jumps the price tag by about $4,000 from that on the Premium Plus, so you will have to decide whether you can justify the additional expense or not. For some drivers, the cost will seem worth it for the extra features that it nabs you. The Prestige has everything that comes on the Premium Plus and makes several notable additions and upgrades. For example, Audi's active lane assist and adaptive cruise control with traffic jam assist both come standard on the Prestige. These safety features help to keep the vehicle at a safe distance from other vehicles and within the boundaries of the lane it is being driven in. Also, a park steering assist feature and a top view camera system are equipped on the Prestige. If you are someone who often has to park in tricky parking spots, having the park steering assist can be pretty helpful. On the interior, the power adjustable steering column is the most noticeable difference between the Prestige and the Premium Plus. There are quite a few benefits to having this tilt-and-telescoping steering wheel set-up, but the most obvious is that it gives you a lot more leeway to adjust to the most comfortable steering position. Up front, both seats are heated, and the driver's seat has a memory function. The seats are all adorned in stunning leather upholstery like on the Premium Plus. The standard audio system also gets upgraded to a state-of-the-art Bang & Olufsen sound system. This audio system has a grand total of 19 speakers that effortless pump crystal-clear sound throughout the cabin. This 755-watt system additionally has a 16-channel amplifier and 3D sound. For those who crave the utmost in sound quality, this trim level has it. Other standard infotainment features on the Prestige trim level include dual SDXC card slots with an operating capacity of 64 GB, SiriusXM satellite radio, and the HomeLink garage door opener. It is also worth mentioning that the Prestige trim gets the biggest and shiniest wheels of the line-up with its 20-inch wheels with a five-segment spoke design. Like the Premium Plus, the Prestige has full LED lights on the exterior, and there are LED turn signals integrated into the side mirrors. The Prestige also has privacy glass on the rear windows and a chic Singleframe grille slapped on the front fascia. The 2019 Audi Q5 is not a cheap vehicle by any means. Investing in one means that you are prepared to spend a lot to get a lot. And, as far as trim levels go, the differences come in terms of design and infotainment and safety features. No matter which trim level you buy, the power output and overall driving performance stays the same. That is why the middle-of-the-road Premium Plus might be the best trim level for most drivers. It keeps the price somewhat reasonable while still offering a respectable number of additional features over what you get on the base Premium trim. Even though it is not the line-topper for the series, the Premium Plus has all of the necessities and then some.